← National Interest, International Relations and International Law — Is Power Politics Dead in this Era of Globalization? Foreign Corruption — More Aggressive U.S. Prosecutions? Yes, They are Needed. The U.S. Dept. of Justice should be more aggressive in prosecuting firms for bribing foreign officials. Bribery is illegal under U.S. and foreign law. It’s unethical and counter-productive for economic and political development. Forget the U.S. Chamber of Commerce. The OECD Convention of Bribery and actions by all governments should be expanded. Corporate officials should do jail time. Bribery results in only more expensive products and services at higher costs. It results in keeping illegitimate and corrupt leaders in power at the expense of developing a viable civil society. It’s regulation would in fact increase competitiveness and global trade. It would put all firms on an even playing field. Corruption is a nontariff barrier to trade and investment. By the way illegal and unethical activity abroad often leads to dubious corporate actions domestically. The international response to corruption over the last forty years is something the U.S. actually initiated by its unilateral efforts and legislation in the post-Watergate era of the 1970’s. One of the few examples of good unilateral actions by the United States in the global trade area. 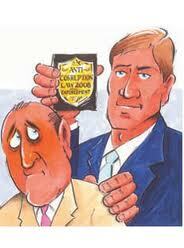 ………… “Global Bribery Crackdown Gains Steam.” Wall Street Journal (March 26, 2014). This entry was posted in Global Trade Relations and tagged corruption and economicand politcal development, FCPA, foreign corporate corruption, OECD Convention on Bribery, post-Watergate era and FCPA, U.S. unilateral and foreign country actions and multilateral initiatives, USDOJ and proescution. Bookmark the permalink.